So, yeah. Not exactly in the same league as the ones above. But the insides--they're prettier than you would believe. Such rich, solid, beautiful storytelling. 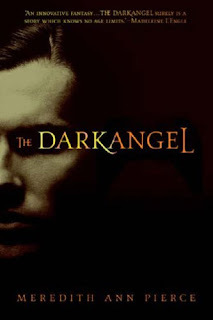 Now, to be fair, The Darkangel trilogy did get a face lift not too long ago and they are much better for it, I think. So I will try (and most likely fail) not to be influenced by the prettiness of Halo's cover, along with my own superstitions regarding the lure of angel stories and the packages they come in, and I will undoubtedly be picking it up when it is published in September. The one big thing it's got going for it is that Feiwel & Friends is publishing it. Not only do they clearly know how to package a book, but they've got a great track record with me. They republished my beloved President's Daughter series, after all. And I've enjoyed several of their recent offerings. So here's hoping! What angel books do you love? I'm always looking for recs. Oooh that Halo cover is stunning! I haven't read the other ones with the beautiful covers because the reviews weren't so great. I just picked up Archangel when I bought A Conspiracy of Kings and I'm looking forward to reading that! More so now that you mentioned that you loved it. I also liked the Darkangel series and I'm lucky because I have the repackaged ones. As for recommendations, I'm also looking for more angel books so I'll check out the responses to your post. Although I did read Nalini Singh's Guild Hunter series and I really liked that even though I don't read a lot of paranormal romance, I liked the world building in that one. Have you read the Mortal Instruments trilogy by Cassandra Clare? Other people classify that as angel books too. Darn it. I know Hush, Hush has gotten bad reviews and I still want to own it simply to have that cover in my collection! I, too, second the recs of Nalini Singh's Guild Hunter series AND Cassandra Clare's Mortal Instruments series (even though the Mortal Instruments has a icky subplot that was pretty predictable IMHO). How about Faith Hunter's Rogue Mage trilogy? All sorts of angels in those and none of the warm and fuzzy kind. I thought it was an interesting take on the subject. I HAVE to admit that the Hush, Hush cover and the Fallen cover are two of my favorites, even if I didn't like the books. 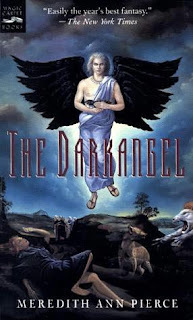 On the other hand, you named two of my faves--the Darkangel Trilogy (because of the superb world-building) is one of my all time favorite series. And I really enjoyed Archangel as well! Chachic, I know! And it really is sad about the covers of the other two. Though there are plenty of people who love them. Just not me. :) I'm so happy to find another Darkangel fan. I just loved them. And you HAVE to tell me when you finish ARCHANGEL. I adore that book. I read Singh's first Guild Hunter book and enjoyed it, though the romance aspect of it was a bit TMI for me. Lol. I've been debating whether or not to pick the second one up. What do you think? And I'm not a fan of the Mortal Instruments trilogy. Just felt so much like reading fanfic, I couldn't get into it. Sandy, it definitely is. 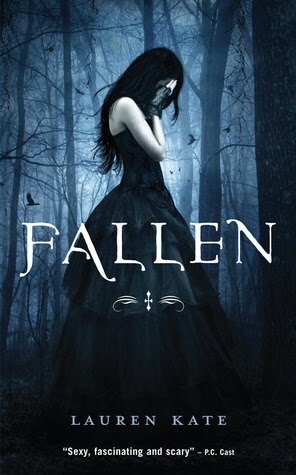 The FALLEN cover is gorgeous! I was so sad to read the negative reviews from readers I trust. Teh lame. Kitten, if you haven't read it you might give it a shot. It could float your boat. Who knows? The cover is just lovely, I agree. Samantha, well done you!! I love it when you successfully convert masses. hehe. What were some of the more entertaining reactions? 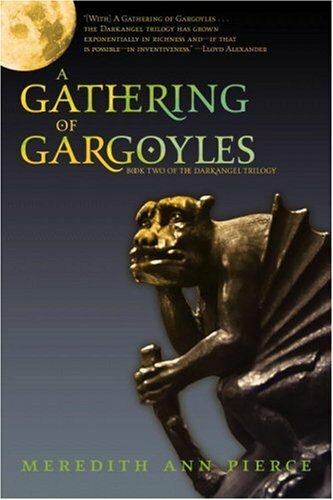 I would LOVE to discuss that book/series with a group. And I've wondered about the Hunter series. I'll have to check my library if you liked them. Kaz, yep, I spotted that as well. Can you believe her age? I'm interested to see what the writing's like. Choco, agreed. I think they're stunning, no question. Which is why I wish the really well-written ones got equally gorgeous covers to bring more readers in. I'm delighted you enjoyed both the Darkangel and Archangel books. I <3 them. And the world-building is just awesome, as you said. Everyone mentioned that if it hadn't have been for the group read suggestion they wouldn't have given it a second glance. I'll add another recommendation for Faith Hunter's books. I really enjoyed them. And I have Archangel on the TBR. I must read some Sharon Shinn. I like the Shinn books lots too! Ugh. Why, why, why do mediocre books occasionally get gorgeous covers, good books bad ones? Here's one to add to your angel-cover list: The Fallen vol. 1 omnibus by Thomas Sniegowski. Instant cover lust at first sight, but I'm so wary because, uh, it's a S&S reprint to make money off the recent rise in interest in paranormal romance, and because it's about angels. *sigh* I really want a GOOD story about angels sometime, something that blows me away and makes me believe in its possibility as a successful paranormal subgenre.. Okay, CLEARLY the solution is to just write one of my own. Grrr. The FALLEN cover just looks to me like a variation on the Forest of Hands and Teeth hardcover. I was at Random House in December and they had this huge 8 foot tall poster of it up on the side of the building and that's all I could think. I like the cover for the sequel much better. I also like the Hush Hush cover much better online than in person. I wish they'd done a matte finish and not a glossy. I have an ARC and the matte finish looks much nicer, IMO. As for the new Darkangel covers, they are much better. However, I'm fascinated more by the titles. I've never seen a series do that -- have titles that are SO difference in tone and length. I've now added Sharon Shinn, Alexandra Adornetto, Meredith Ann Pierce, and Cliff McNish to my wishlist. Whew! The only angel book I've read is Fallen, and I didn't like it. Samantha, have I mentioned you have me drooling? I dream about belonging to such a book group. And being able to read and share books like this that you love. I'm bowled over by the way she evokes the glorious music every time I read ARCHANGEL. It's like I can hear the gloria and Rachel's voice. And I'm absolutely tickled that they're passing it on and that they didn't let Rachel's obstinacy get in the way of enjoying the novel. *sigh* You've made me happy. Charlotte, ooh, thank you! i haven't read (or heard of) any of those three. I would like to be first in line if you do write one! You know, my ARC of Hush, Hush was glossy. I thought the hardcovers were matte. But I haven't purchased one myself. Strange. I agree, much much cooler in matte. And I completely agree about the Darkangel series titles. I fell in love with them years ago when I first read them before I really started studying these trends in series titling, packaging, etc. But they've always seemed lyrical and haunting to me, though perhaps not conducive to catching and staying in the minds of potential readers. 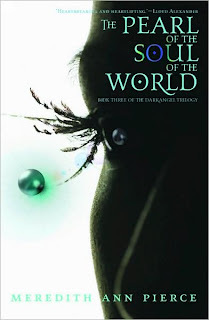 How often do you come across a YA title as long as THE PEARL OF THE SOUL OF THE WORLD? Lol. Jen, ha! I can do that as long as it doesn't kick me out of the groove. I'll have to give ARCHANGEL'S KISS a try. I remember finishing the first definitely wanting to know what happens to Ilium and Dmitri in particular. Brenda, yeah. Don't think I'm going to be going there anytime soon. And if you're feeling angelic at any point in the future, I do recommend the Shinn or the Pierce. I generally avoid stories with angel or demon love, but I'm reading an angel-based novel now called Angelology. It's more of a supernatural suspense, and it's definitely adult material. 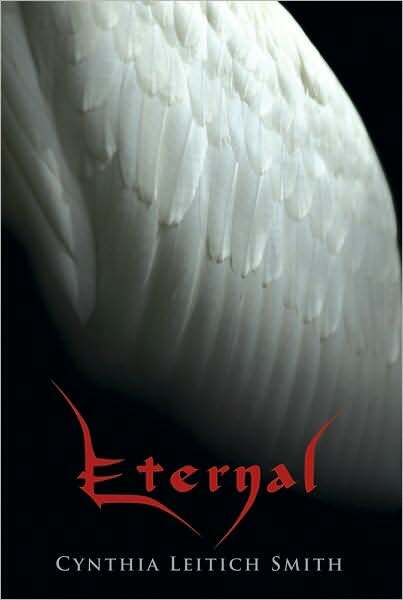 The cover isn't great -- it shows a boyish angel with a smooth torso and lovely white wings. Within the novel itself, however, the angels (actually nephilim) have golden or multi-colored wings. I'm not a fan of the Mortal Instruments too! I read the whole series because it was highly recommended but I didn't like the twist. I'm sure you also read the other Samaria books by Sharon Shinn if you loved Archangel. 'The Alleluia files' is my personal favourite from that series I must confess, closely followed by 'Jovah's Angel'. Another angel book that I loved was 'Fallen Angel' by Margaret and Lizz Weis. I love angel cover art, too. Some of those are beautiful and yeah... Halo is stunning. 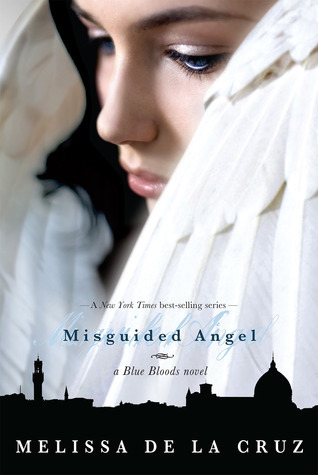 I love Nalini Singh's Angels' Blood, and have heard great things about its sequel, Archangels' Kiss, but I haven't read the latter yet. Have you read Meljean Brook's Guardians series yet? It's sort of an angel (guardian) and demon world.. but the world building and writing is really fantastic. You have to admit that Archangel is a pretty bad cover - but an amazing book. Although I haven't ever heard of the Pierce series - it looks like those are another series that need to go on the TBR pile. Tia, I actually saw ANGELOLOGY at the store the other day. Are you enjoying it? Chachic, oh, good. I couldn't picture you really liking the Mortal Instrument books. I wonder what her new series is going to be like? Sullivan, I have! And I happen to think THE ALLELUIA FILES has the best ending of all of them. Takes my breath away every time. And JOVAH'S ANGEL is perfectly lovely. And thanks for the Weis rec! Christine, I haven't read any of Meljean's books yet. I really enjoyed her novella in MUST LOVE HELLHOUNDS, though, so I'm thinking I'd better get a start on the Guardians series now. limo hire, it is pretty, isn't it? Have you read the series? Michelle, you definitely need to read the Pierce. You will likey. Samantha, aww, thanks for that. How interesting..if it's the same Alexabdra Adornetto I'm thinking of, shes an incredibly young writer whose previous works are very Enid Blyton-ish. If the cover of Halo is anything to go by, looks like she's grown up. I'll definitely be picking up this book for my Horns and Halos challenge...absolute bonus that she's Aussie! I've actually never heard of the books you mentioned as your favorites, I will check those out. Aimee, yep, that's the one. I've not read her earlier stuff so I'm interested to see what her writing's like. Nice that it works out so well for your challenge! Ladybug, awesome. I would love it if you gave ARCHANGEL and THE DARKANGEL a shot.